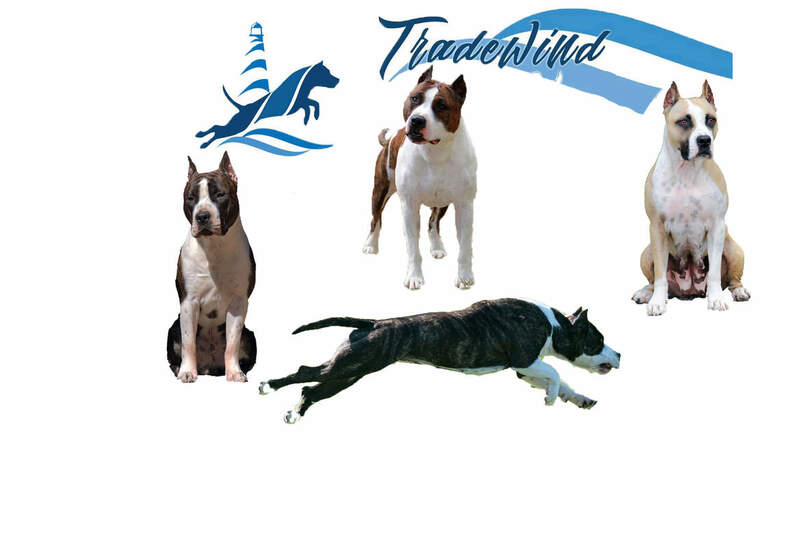 Here at TradeWind, our goal is to keep the American Staffordshire Terrier true to the breeds standard. Temperament and health are most important, along with maintaining proper structure and type. A true Amstaff should also possess athleticism, drive and working ability. From the AKC Breed Standard "His Courage is Proverbial". This is key when referring to the Amstaffs temperament. The American Staffordshire Terrier should always be forthcoming, and have a friendly, outgoing nature. They should NEVER display human aggression and should not be shy, timid or afraid to meet a stranger. A well bred American Staffordshire Terrier is a wonderful, loving family companion. They are great with children, and will watch over their home and family. They can be stubborn and tenacious, as well as playful clowns. One must realize that, when looking for a dog to be part of your family, the Amstaff is not a breed for everyone, and you must have an understanding of the breed and accept the responsibility of owning one. We do not breed often, and if a breeding is planned, it is to add another Amstaff to our family. Our dogs are very well socialized from puppy hood to adult, where we feel that proper socialization is a key factor in a dogs development and behavior. Health screenings are done on all our dogs. No breeding will be considered without these screenings being done on our dogs as well as any considered sires or dams. Our dogs are tested by board certified cardiologists for their heart exams and are tested for Ataxia. Please visit our news page for more information regarding health testing. We are active in Conformation, Barn Hunt, Obedience, Rally, Coursing Ability Trials (CAT) and other activities with our dogs. I am a board member of the Staffordshire Terrier Club of America, board member and Treasurer of the Wampanoag Kennel Club, and member of the Massachusetts Federation of Dog Clubs. I am strongly involved with Legislation and the protection of this wonderful breed of dog. I am also a tester with the American Temperament Test Society. Please feel free to contact me with any questions regarding the American Staffordshire Terrier or breed specific issues in your community. * Our dogs are fed RAW food. We feed it for the natural benefits it provides. Fresh bone, meat, muscle, and organ make up this natural based diet. We have found that by feeding the Raw diet, our dogs have excellent skin and coats, clean teeth and healthy gums, strong immune systems, and natural muscular development. By feeding a raw diet, there are no chemicals or preservatives taken in by our dogs. Skin problems, allergies, and other health related issues have all been linked to commercial diets. If a raw diet is not for you, please feed your dog a grain free, high quality kibble. We also use essential oils on our dogs, from flea and tick preventatives to overall well being. If you have any questions or would like information regarding the holistic care of your dogs or the safe use of essential oils, please feel free to contact me. No Dog will ever be placed or sold without thorough screenings of the perspective new owner. Please be responsible and know where your puppies/dogs are, and always be willing and able to take them back if their new homes do not work out. Practice responsible ownership, know the laws in your community and the importance of leash laws and Dangerous Dogs laws. Breed Specific Legislation is a result of irresponsible ownership !! You must be responsible for the proper upbringing, care, training, and socialization of your puppy/dog. No dog will ever be sold for any illegal purpose. We reserve the right to refuse ownership to any individual that we feel cannot provide for and care for their new dog/puppy as we do. Luna now has her RATN, getting her last 2 legs in Louisville, KY. Baz did very well also, and was Best in Sweeps and Best of Opposite Sweeps at the 2 specialties in Louisville.